Black people in Libya are suffering the most from the conflict. 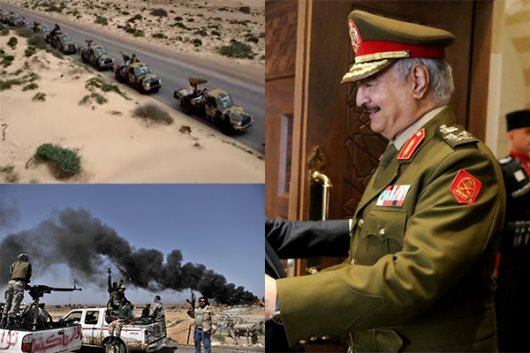 AFRICANGLOBE – Libya’s internationally-backed government is deploying forces in and around the capital, Tripoli, after renegade General Khalifa Haftar on Thursday ordered his eastern military forces to advance on the city, sparking fears of a major showdown with rival militias. Earlier on Friday, some troops of Haftar’s self-styled Libyan National Army (LNA) were pushed back from a security barrier by a militia in Zawiya, fewer than 30km from the capital. Interior Minister Fathi Bashagha told reporters that Haftar is making his move at an unprecedented time of calm. The Misrata-based forces “stand ready … to stop the cursed advance” of the LNA, they said in a statement. “The Libyan people should resist and fight against Haftar’s forces in Tripoli in order not to see crimes against humanity committed in [the eastern cities of] Derna and Benghazi,” Grand Mufti Sadiq Al-Ghariani said. Journalist James Bays said it was notable that two of the countries that signed the statement – France and the UAE – have supported Haftar. Journalist Mahmoud Abdelwahed said on Thursday that “things are moving from bad to worse”. Previous articleCollege Student Sentenced To 12 Years In Prison For Kissing A White Girl?